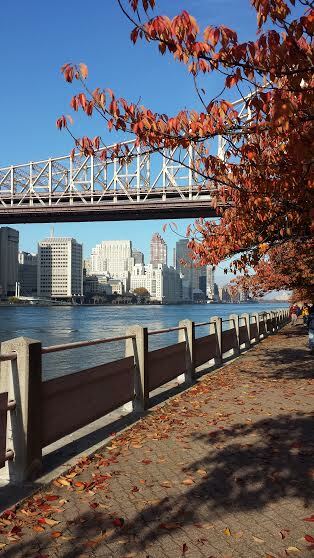 Ed Koch-Queensboro Bridge viewed from Roosevelt Island. I guess you could say it started with that bridge, which connected the borough of Queens to the island of Manhattan and points west in 1909. The zenith was reached last week, when the world’s largest travel guide publisher, Lonely Planet, released its 2015 recommendations, naming Queens (and “worth a detour” Rockaway Beach), as the number one tourist destination in the U.S. Not just AMONG the top destinations, as you might think if you had only read the N.Y. City Parks Twitter feed. THE number one place. Yahoo headlined with: “From the Experts—10 Must See Destinations in 2015.” Their post featured a stunning photo of the deck at Thai Rock, facing the Cross Bay Bridge and a picturesque Rockaway sunset. Unfortunately, the LP guide (and the “Local Knowledge” box) mentions only one seasonal eatery on the Rock, leaving out Thai Rock and other choices for good dining and views. As in the past six years, for the herds of Rockaway visitors, it’s all about the taco. Perhaps someone wants tourists to think they’ll be on that deck overlooking the bay, with the taco. Instead, you are usually standing in line on a sidewalk for over an hour just to hold that yummy little tidbit in in your hand. If you are lucky enough to get a seat, it’s on a barrel with the thing in your lap. Don’t get me wrong, food stands and food trucks are delightful and kitschy. But can we go beyond the taco, for a change, and support the local businesses that endure, year round, to serve everyone in the community, as well as summer tourists? Is it possible for a visitor to actually experience the unique vibe throughout the 80-some neighborhoods of Queens? Does the appeal of Queens go beyond the diverse, inexpensive ethnic foods to be had? Can you explain to a tourist why many Queens residents, unlike those in nearby Brooklyn, prefer to live in a place that has so many unique neighborhoods? Although their reviewers like the food in Queens, LP recommended mostly Manhattan hotels, concluding that the “prevailing industrial setting” in Queens makes it far less charming than Manhattan and Brooklyn. Quite a broad generalization to make about what is, in terms of geographic area, the city’s largest borough, and second-largest in population. If you only have a day trip, and spend most of it seeking out food, you will come away with a less than complete introduction to Queens. Before it opened its gaping arms to millions of immigrants and developers, the Queens mainland was once sparsely populated by the operators of farms and small businesses, who served up fresh produce and other goods to Brooklyn, Manhattan, and points beyond, long before the hipsters arrived and started planting lettuce on the roofs in Williamsburg. From Flushing to Ozone Park and the Rockaways, fruit trees still abound due to our mild night-time winter temperatures along the ocean and bays. 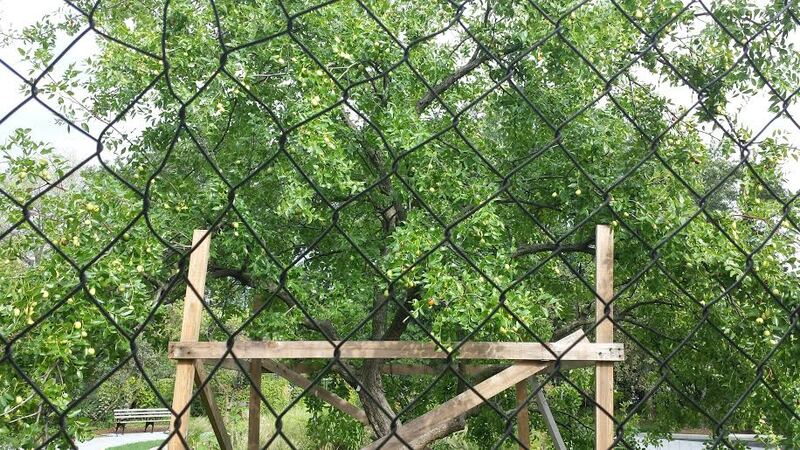 Trees bearing persimmons, peaches, pears and apples thrive in our gardens. If they can ever get to light and water, amidst all the development. 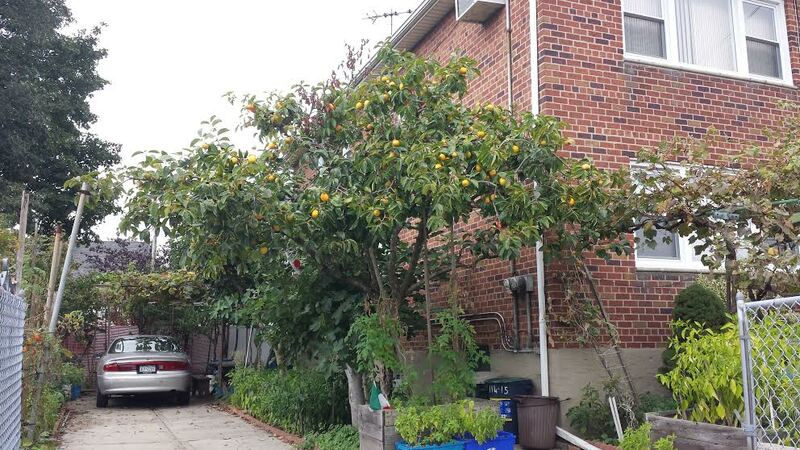 Persimmon tree, Flushing, summer 2014. Speaking of development, it’s been wildly overdone in Flushing, in my opinion. Important historic sites like the Quaker Meeting House and the John Bowne House are surrounded by some of the tackiest buildings imaginable. It would be a tragedy to completely obscure these physical remnants of the early colonial community and the Flushing Remonstrance, one of the key chapters in the fight for religious tolerance in pre-revolutionary America. Egret in Broad Channel home, summer 2014. 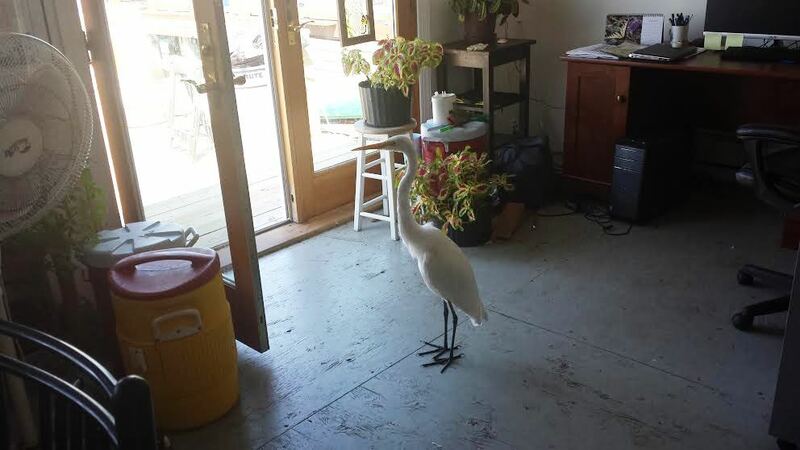 If you decide to come to Southeastern Queens and stay a bit, you could book an overnight rental in a Broad Channel home that sits directly on Jamaica Bay, where an egret might walk in the door looking for a meal. Then, you’d understand the appeal of Queens a bit better. You’d be even more surprised to learn that Broad Channel and Rockaway Beach, which adjoin each other and share a zip code, are vastly different neighborhoods. Both have rich and interesting histories of colorful bootleggers and prohibitionists, and in its heyday, the world came to Rockaway Beach for fun. Rentals in private oceanside homes are available, on occasion. Come, and stay for a walking tour of the area, which will be offered at this webpage in the spring of 2015. If your flight is out of JFK and you’d like to visit the beach and sample Resorts World, there are many hotels near the airport. That would give you a taste of “plane spotting,” touted by LP’s local knowledge expert. In my opinion, plane spotting is only amusing in movies. 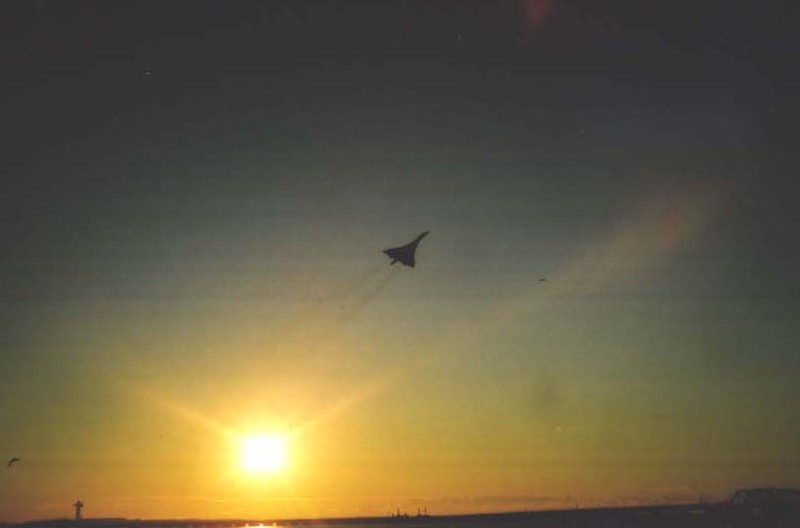 When you are trying to sleep or have a conversation in your home, being awakened or interrupted by plane noise is not charming. Yet, with public transit to Rockaway often taking two hours each way outside of weekday rush hours, your transit time and taco wait can eat up a good part of a day trip. So overnight lodging is a good idea, if you can afford it. My guess is that well-informed tourists short of time or money will head for Flushing, which the LP Guide touted as “Chinatown without the tourists.” Not quite true, since many NYC tourists hail from Asian countries, not just Ohio and Pennsylvania. But thank you anyway, LP, for letting the world in on this closely held, local secret. My daughter’s favorite Korean eatery, Kimganae on Union Street, is populated almost exclusively by Asian locals. The entire New World Mall food court, on Roosevelt Avenue, with over 60 vendors, where we grabbed some good, cheap, authentic Asian food on the Tuesday before Thanksgiving, had exactly two Caucasian diners that day among the hundreds we observed. Next year, the tour buses will arrive, the place will get even more crowded, and sooner or later, someone from Iowa will ask: Is there a McDonald’s in here? Text and photos copyright Vivian R. Carter 2014, unless otherwise noted in captions. This entry was posted in Business and Economics, Jamaica Bay, The Arts and Entertainment, The Built World, The Land We Share and tagged community, developers, Flushing restaurants, Gardening, local news, Lonely Planet, NYC Parks & Recreation, Queens restaurants, Queens Tourism, restaurants, Rockaway, Rockaway History, Thai Rock, transportation. Bookmark the permalink. 2 Responses to 2015–Year of the Taco–Again? A lovely and astute post! But one minor note: While the LP guidebook may have glossed over Rockaway a bit, it’s worth noting that their most recent web article for Queens, published just a week in advance of their “Best in the US 2015” list, was a bit more thorough. Yes, it does overlooked Thai Rock (one of my favorite local eateries) but it does mention several year round eateries in addition to Rockaway Taco, giving shout outs to Playland Motel, Uma’s and another of my favorites, the widely overlooked TheRockNYC. Hi, thanks for your kind compliment on my post, NarrowbackSlacker. I like your blog, as well, and appreciated learning about the earlier Lonely Planet piece. I also like Uma’s very much, and Thai Rock has been, in many ways, the night-time social center for the local arts community ever since it opened. Robert and Metta are THE BEST! Haven’t been to TheRockNYC or Playland Motel yet, but I do love both of their next-door pizza neighbors, Elegante and Whit’s End. How about Goody’s? Nobody ever mentions their authentic, out-of-sight jerk chicken and other West Indian specialties. They gave hundreds of new customers an introduction to their cooking at the Fall Festival on Beach 116 Street in October. I hope that event will raise their profile in the neighborhood a bit more.